The book Gulliver ‘s Travels has been a children’s favorite ever since it was written almost 300 years ago. In this novel by Jonathan Swift, Lemuel Gulliver is a sea captain who on three different occasions is shipwrecked. Each time, he finds himself washed ashore on strange and undiscovered islands which no Englishman had ever seen. Each island is inhabited, but by beings unlike any Gulliver had ever seen. On the first island, there lives a race of little people, only six inches tall, and Gulliver is a giant among them. On the next island, there are giants over forty feet tall, and Gulliver is like an insect among them. On the third island, the people are of a normal size, but there is another, even bigger difference there. On that island, the humans are like dumb animals, living in the woods like savage beasts, and are not able to speak. In that land, they are called the yahoos (now you know where that word came from– Swift invented it for this book). The civilized beings there are the horses. It is the horses who live in houses and are able to talk with each other and have a civilized life. Even if you have not read this book, you can well imagine that Gulliver would have had many interesting adventures in these places, making the book a classic for children. The most interesting part for me is the final part, in which Gulliver visits the land of the talking horses. What is fascinating is that these horses have a perfectly moral and good society. It is unthinkable for any of them to steal, to be in any way mean to anyone, or to be anything less than completely honest. They do not even have a word for “lying” because a lie is never told among them. Everyone has complete and total respect for everyone else, and all live at peace, without fear and without harmful vices. It is a perfect society. It takes Gulliver a while to get used to talking with horses, but once past the initial awkwardness of that, he doesn’t want to leave them. When circumstances make it necessary for him to journey back home, he does so with great reluctance and regret. And then, once back in England, it is difficult for him to again get accustomed to the dishonesty, meanness, and impoliteness of human society that we take for granted. In fact, Gulliver never adjusts to his previous life, preferring to stay at home alone because he can no longer bear to live with such wickedness. Thus, Jonathan Swift, the minister, is teaching his readers about Christian morality in a creative and effective way. He doesn’t go on and on harshly with ‘Thou shalt not do this, and thou shalt not do that— or else.’ Rather, he simply and winsomely describes a place in which everyone does what is right and there is no sin, and depicts how pleasant it is to live there. Gulliver can see for himself how wonderful life is in the land of the talking horses. 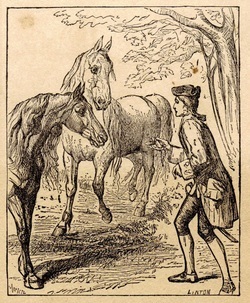 When he tries to tell the talking horses how life is in England, with everyone trying to take advantage of everyone else by every sort of dishonest trickery, along with damaging their own lives and health and well-being with every sort of vice and sinful pleasure, the horses cannot believe that rational beings would act that way. And the way Swift describes what we consider normal human life, makes how we live look very foolish and wicked indeed. Thus, in Gulliver’s Travels, goodness and obedience becomes attractive; whereas so often in our world it often looks as though anyone who wants to be good and do what is right is bound to miss out on all the best life has to offer. Romans 12:2 — Do not conform to the pattern of this world, but be transformed by the renewing of your mind. Then you will be able to test and approve what God’s will is— his good, pleasing and perfect will. Psalm 128:1 — Blessed are all who fear the Lord, who walk in obedience to him. Deuteronomy 30:15-16 — See, I set before you today life and prosperity, death and destruction. For I command you today to love the Lord your God, to walk in obedience to him, and to keep his commands, decrees and laws; then you will live and increase, and the Lord your God will bless you in the land you are entering to possess. O Lord, we pray that you give us grace not only to be hearers of the Word, but also doers of the Word; not only to love, but also to live your Gospel; not only to profess, but also to practice your commandments; for the honor of your holy name. Amen. This entry was tagged morality, Stories. Bookmark the permalink.